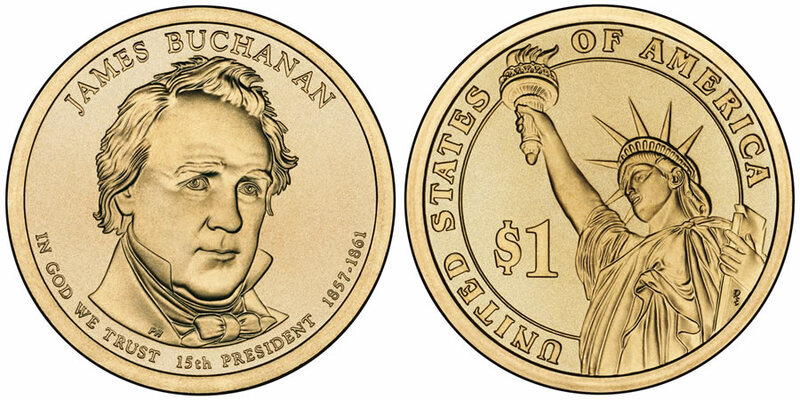 The fifteenth release in the Presidential coin series is due out on August 19, 2010 and will be the James Buchanan Presidential $1 Coin. Elected during the turbulent political times leading to the American Civil War, Buchanan appeared overwhelmed by the daunting task. His position that the slavery issue would be permanently decided by the Supreme Court only led to further political divisiveness. During his term, congressional members of the Democratic Party split into North and South factions which resulted in a federal government stalemate that would not be broken until several states started seceding from the Union. By the end of his term, Buchanan had adopted a policy of inactivity which further infuriated his opponents. Phebe Hemphill designed and engraved the portrait of James Buchanan that is seen on the obverse of his coin. Surrounding his portrait are the inscriptions "JAMES BUCHANAN," "IN GOD WE TRUST," "15TH PRESIDENT" and "1857-1861". Don Everhart designed the image of the Statue of Liberty that is seen on the reverse of all Presidential Dollar coins. Around the statue the inscriptions "UNITED STATES OF AMERICA" and "$1" are shown.